Every new episode will involve a reader's suggestion coming to life, chosen from the reviews of the last book! If you'd like to see something happen to Jack, Alex, and Steve, make sure to let me know in the review comments! If you'd like to see a new character or mob or anything else, let me know in the reviews! Tell me their name, stats, skin, etc., and I might put it in the next episode! After a completely unexpected midair battle between an Ender Dragon and a freaking Wither, the village to the east of Jack, Alex, and Steve has suffered a lot of damage. The two Minecraftians and Jack the 'Weird Walker' head straight there to help repair the blown-up houses before sundown. If they don't, many villagers will likely be killed over the night! Can they survive the night and save the villagers? And if they survive until dawn, what interesting things will Jack find in a Minecraft sandstone village as a real human boy? And will Steve finally get to help KittyPaws30 build a swimming pool?! 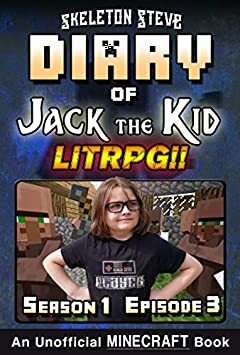 Read Season 1, Episode 3 of Jack the Kid, a Minecraft LITRPG Series ... now! Join the Skeleton Steve Club! Check out my main website for details--it's in the book!